If you’ve visited a spa and wellness center recently, you’ve likely seen a Reiki treatment option on the menu. What is Reiki exactly? The mysterious Japanese energy technique comes with much controversy despite its growing use by millions as a form of alternative treatment. It is used in Western hospitals as part of a holistic approach to treatment that addresses the physical, mental, emotional, and spiritual needs of patients. Purported Reiki health benefits range from treating mild cases of anxiety to managing more serious debilitating and painful conditions. Trained Reiki practitioners are believed to transfer healing energy from the universe to the patient through their hands to treat an ailment. This form of therapy is also used as a preventive tool by healthy individuals on a regular basis to maintain good health. A complementary health discipline, Reiki is based on the theory that the human body is made of a universal life energy, or ki. This energy and the body’s physical components (tissue, nerves, bones, muscle) work together to maintain balanced health and well-being. The universal ki flows into and out of our bodies by way of energy centers, referred to as chakras. Chakras control the amount of life force energy that encompasses not only the spiritual and emotional states but also the physical and mental health. The energy is transmitted throughout these channels through means of energy meridians and nadas to balance the body and its functions. How Does Reiki Work, Supposedly? Reiki Benefits: Science or Placebo Effect? Reiki is an alternative therapy derived from the spiritual principles of ancient Japanese culture. The term “Reiki” comes from the Japanese words Rei, meaning God’s wisdom or the Higher Power, and Ki, “life force energy.” Behind it is the belief that by harnessing the energy of the universe, humans can treat ailments, diseases, and disorders. Dr. Mikao Usui, a Japanese Buddhist and scholar, is credited with reintroducing the concept in the 1920s. He founded the widely used Usui Reiki method following a 21-day meditation session on Mt. Kurama in Kyoto, Japan. In his therapy, Usui added fundamental ideals, or guidelines, to help broaden the techniques on a spiritual level. These virtues derive from the Five Principles, developed by the Meiji emperor of Japan, Emperor Mutsuhito. By adhering to the Reiki therapy, the Ideals direct clients to understand their own power in healing themselves. The use of Reiki promotes the ideal of caring for one’s physical and mental health. Usui taught Dr. Chujiro Hayashi, among others, in order to carry on the teachings. Hayashi expanded the healing techniques to include more hand positions. One of his patients, Hawayo Takata was so intrigued by her own results that she became a Reiki master and introduced the therapy to the United States. Today, Reiki is part of treatment plans in some hospitals and rehabilitation clinics. The Washington Post reports that more than 60 hospitals in the United States alone use Reiki as part of a holistic treatment plan. Used as an alternative medicine treatment, the Reiki practice is intended to balance the inner life force of a person. This includes the mind, spirit, and body. It’s important to note, however, that no scientific evidence of this “life force energy” exists. According to Reiki teachers and followers, healing is accomplished through the use of hand motions which reduce stress and promote relaxation. The practitioner’s hands are placed on or near the energy chakras of the person’s body to open and balance those that are blocked. Blocked chakras are thought to lead to multiple health problems, which correspond to their location on the body. For example, an imbalance of the fourth chakra, located in the chest, might theoretically result in heart and lung problems, as well as issues with the immune system. The holistic healing reportedly expels any tension and stress from the particular region of body to promote the healing of the physical or emotional ailment. While many health professionals question the workings of Reiki, some clinical research has shown improvements in cases of high blood pressure, rapid heart rates, and unbalanced stress hormones. As Reiki is used to treat both emotional and physical medical conditions, research has focused on the success rate in areas related to pain, anxiety issues, and chronic health problems. There isn’t a large body of research on the health effects of Reiki. Existing studies are generally considered to be low in quality, due to small sample sizes and lack of placebo controls. Furthermore, most studies did not look at the same health conditions, which makes it difficult to compare results. Clinical trials have examined Reiki’s effectiveness on heart disease, infertility, cancer, degenerative disorders, Crohn’s disease, depression, and autism. Despite the possibility that Reiki could benefit many stress-related ailments and diseases, many experts remain skeptical of a practice based on universal life energy, a concept with no empirical evidence. According to the National Center for Complementary and Integrative Health, Reiki hasn’t been clearly shown to be useful for any health purpose. Dozens of clinical trials and studies have continued to search for answers. A recent study focused on using this form of therapy to treat the symptoms of colorectal cancer patients. The results, published in Complementary Therapies in Medicine journal, reported that using Reiki did not reduce symptoms of insomnia or depression in the majority of participants. Those who appeared to have a sudden enhancement in mood expressed support for alternative therapies such as Reiki before the trial began. The results were different for cancer patients recovering from breast cancer in a 2012 study reported in the Cancer journal. Two groups of cancer survivors were split into those receiving certified Reiki treatment and those receiving bogus Reiki therapy. While both groups showed a reduction in fatigue, participants who received the real therapy saw significantly better results in fatigue treatment. From these and the results of other clinical trials, it appears that the outcome of Reiki therapy may be based on the beliefs of the individual receiving the treatment. So, what is Reiki? It is a hands-on therapy meant to stimulate the “life force” within the body to heal physical, emotional, and mental ailments. The Japanese energy method has been used and expanded over the years as new developments in the treatment are discovered. By using Reiki hand techniques, healers supposedly open the blocked energy centers of the body. This allows the universal life force to target the affected area. As tension is alleviated, the positive energy is said to promote healing in the individual. Scientists have concluded that it is uncertain whether Reiki is helpful, though there appear to be no harmful side effects. Those with serious or chronic health conditions should not use the therapy to replace conventional treatment. To discover the potential benefits of Reiki therapy for you, it’s best to contact a certified and well-versed Reiki master. “What Is Reiki?” Reiki; http://www.reiki.org/faq/whatisreiki.html, last accessed March 9, 2018. Gifford, L.E., “How Does Reiki Heal?” Reiki; http://www.reiki.org/reikinews/rn960402.html, last accessed March 9, 2018. “Reiki In Depth,” National Center for Complementary and Integrative Health; https://nccih.nih.gov/health/reiki/introduction.htm, last accessed March 9, 2018. Newman, T., “Reiki: What is It And Does it Work?” Medical News Today, April 8, 2016; http://www.medicalnewstoday.com/articles/308772.php, last accessed March 9, 2018. “History of Reiki,” International Association of Reiki Professionals; https://iarp.org/history-of-reiki/, last accessed March 9, 2018. 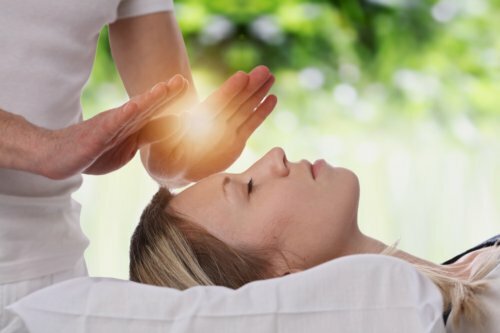 Medaris Miller, A., “What Is Reiki?” US News, November 10, 2014; https://health.usnews.com/health-news/health-wellness/articles/2014/11/10/what-is-reiki, last accessed March 12, 2018. Droste, T., “The Origins of Reiki,” HowStuffWorks; https://health.howstuffworks.com/wellness/natural-medicine/alternative/origins-of-reiki.htm, last accessed March 23, 2018.